Face painting is an amazing colorful world! Whether you have been asked to face paint as a volunteer for the very first time in your life, you’re a mom that wants to enhance your child’s birthday party, you want to make some extra money with face painting, or you want to learn how to face paint just for fun… this GUIDE is for you! In this detailed face painting tutorial you will find out the best face paint brands, how much a beginner’s kit will cost you and what to put into it. 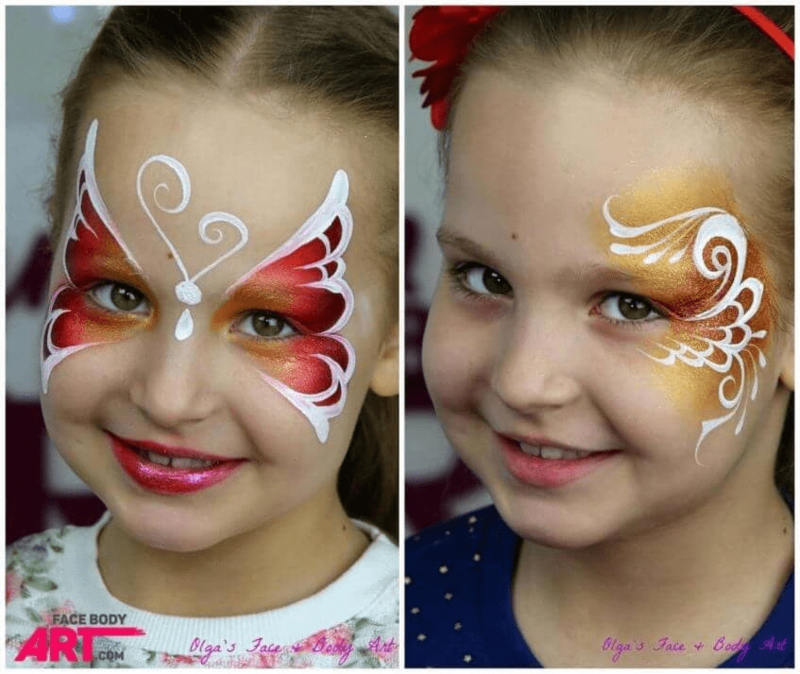 You’ll learn to face paint a selection of pretty, easy and quick designs and much more. What is the Best Face Paint Brand? Where to Buy Face Paint? What Colors Do You Really Need? What Paints Are Safe for Face Painting? The face and body art industry is undergoing a complete renaissance and is very quickly evolving, just as any art form does. There are so many techniques and products coming onto the market that it can seem very daunting for someone who isn’t in the industry. So what do YOU need to know? You don’t have to be a seasoned professional to add a bit of color and sparkle to your child’s birthday, your fundraiser or your local production of The Wizard of Oz. Though you don’t have to be licensed to face paint for fun, you do need to be safe! Inferior paints and products not only ruin the look of your designs but can actually be dangerous on the skin. Instances, where volunteers are using acrylic paint on skin, can cause allergic reactions like rashes and welts, chemical burns and more. But do not worry! You don’t have to spend a million dollars to achieve beautiful results. We make face painting for beginners simple and fun and in no time you’ll be painting like a pro! Before you can get started on this step by step face painting guide you must have at least a basic set of supplies and materials. Generally, these can be found pretty easily from any face painting shop. You also don’t need to buy every single thing mentioned here but all these tools do have a place depending on what you’re trying to accomplish with your designs. We’ll speak more about each of these points below. Professional face paints are water activated glycerine or wax-based and have been tested for safety, which means that they follow CSPA, FDA, EU and Australian Standards guidelines. Note: CSPA — U.S. Consumer Specialty Products Association, FDA — U.S. Food and Drug Administration, EU — European Union. 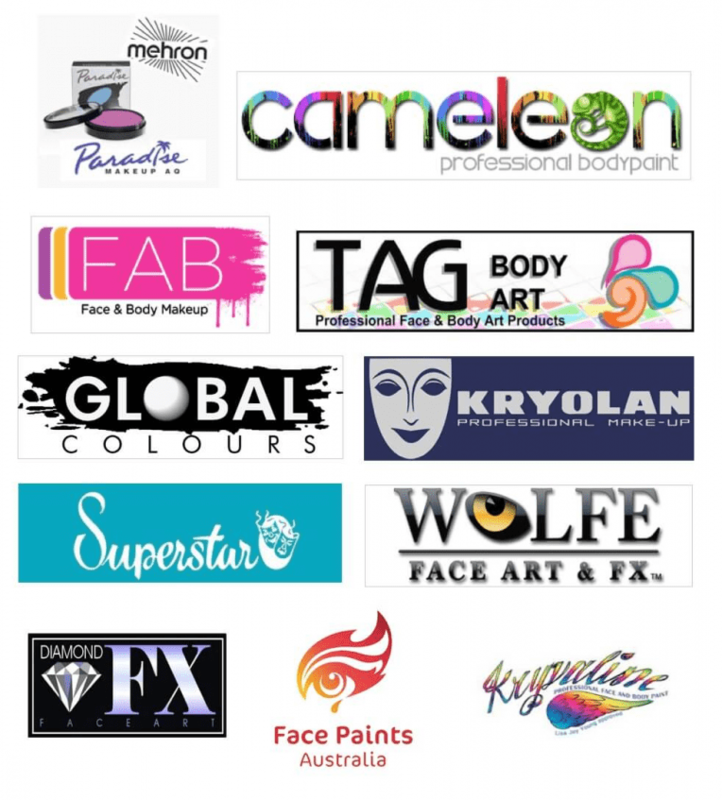 Best face paint brands at the moment include: TAG, Wolfe FX, Diamond FX, PartyXplosion, Cameleon, Kryolan, Global Colours, Face Paints Australia, Mehron Paradise, Superstar, Kryvaline. 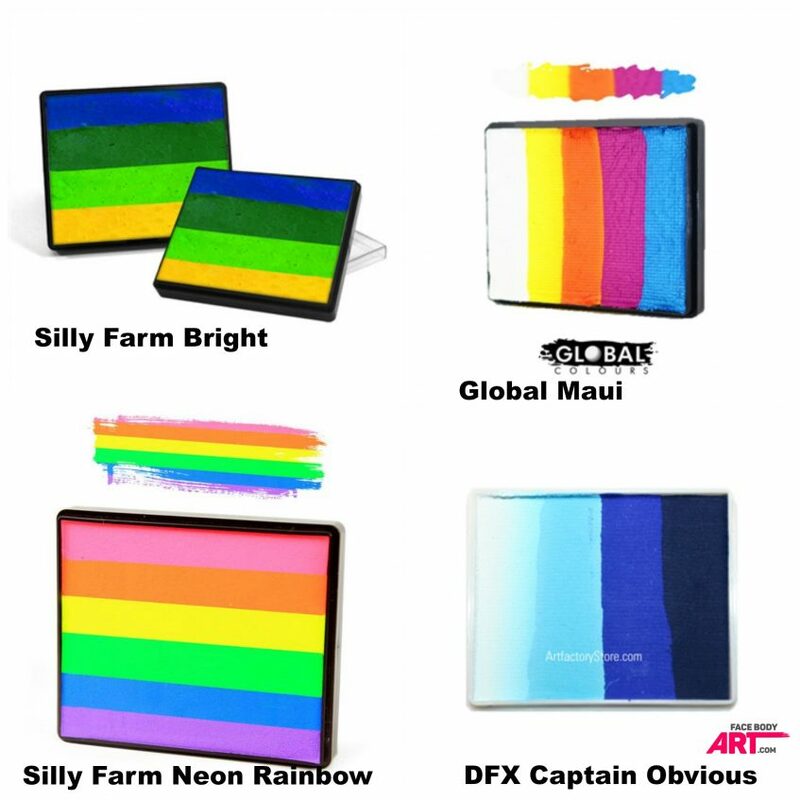 A note on Snazaroo: we are intentionally not including Snazaroo in this list, although statistics show that most face painters start their career with this brand. Although Snazaroo is a safe product, that follows FDA, EU and CSPA guidelines, most of the paints are not as bright and vibrant comparatively to the other brands listed above. The paint often cracks on the skin and it is more difficult to achieve a uniform coverage with it. It is also very tricky to use for linework and can leave you frustrated. Some brands like Global and Kryolan also produce liquid face paints. If that’s the only option available on the market for you, you may try working with them. Although, I find these paints more difficult to work with and the results aren’t as good as with dry cake face paints. 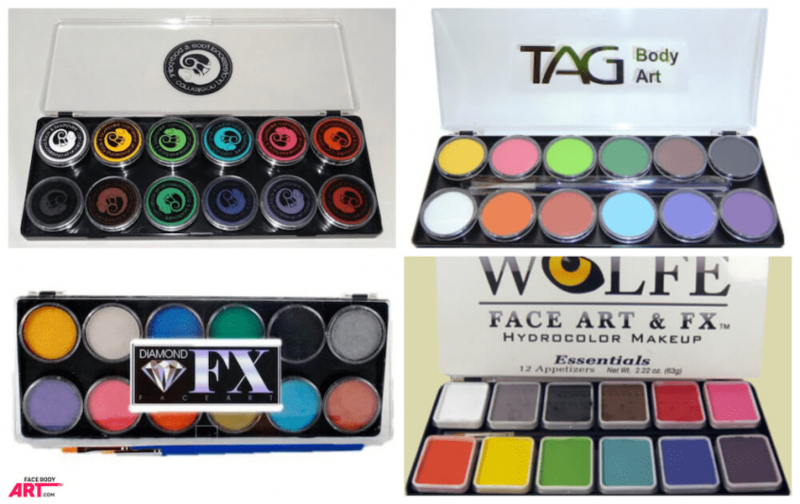 Read our article “The Great Face Paint Shop Guide” for an in-depth guide on trusted shops and sites all over the world to purchase your professional equipment. These shops are great, but don’t get overwhelmed by the vast selection! Face paints are sold in round or square containers of 30, 32, 40, 45, 60 and 90 grams. As a beginner, you may not need singular colors in larger amounts, but some colors get used far quicker than the others. White and black are the two most important and widely used colors in face painting, primarily for linework. Invest in a 30-32 gr or even in a 45 gr pot for both white and black. 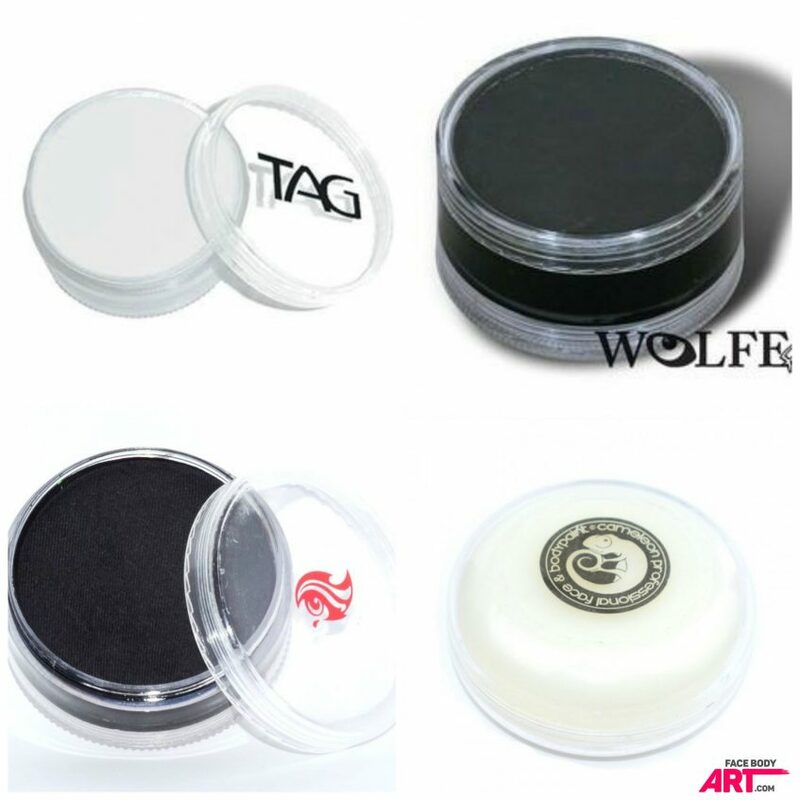 Best brands of white and black face paint for linework are: Wolfe FX, Diamond FX, Kryvaline, PartyXplosion, Cameleon, Face Paints Australia (FPA), TAG. Now, think about what additional colors you may need. If you are purchasing for a specific design (i.e. a Halloween costume or theater production) take a moment to think about the specific colors you’ll need to achieve these looks. 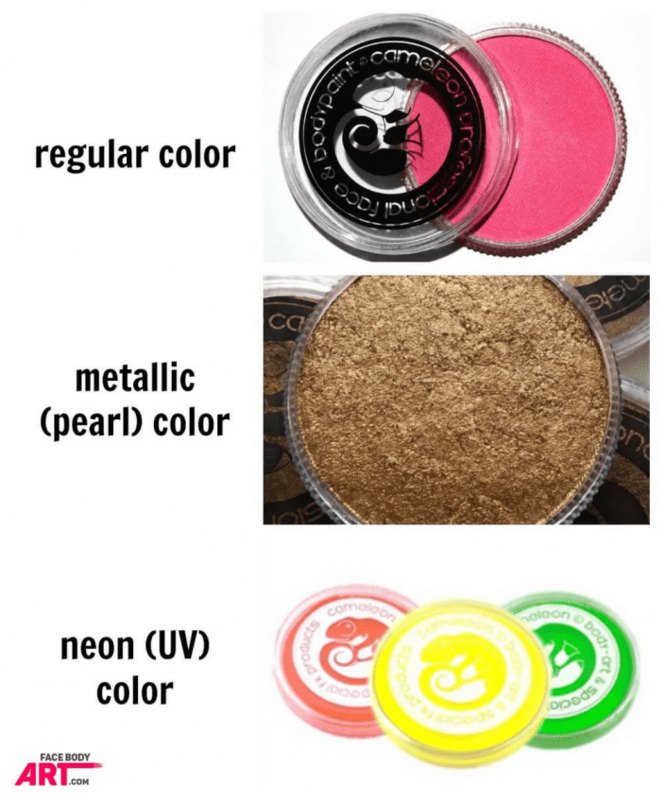 If you don’t necessarily need specific colors, but want to purchase a variety without breaking the bank, a starter kit or multi-color palette are fantastic and affordable options. You may find palettes made of solo regular colors, solo metallic colors or solo UV-colors. Examples of palettes of 6 colors each. Examples of palettes of 12 colors each. You’ll get a variety of colors in a smaller version and some kits even include sponges and brushes. Take a look at these kits for an idea of what you might want to purchase. This is an optional addition, but it can make a big impact. You may opt-out of this purchase if you are on a super tight budget, but it will become a time savior in case you need to work on a long line of kids. A rainbow combination is perfect for the beginning! Children love rainbows! All you need is a flat brush to use it. We will show you how to use your one stroke split-cake in the Designs section. Another optional tool that will help you achieve soft gradients in no time flat! Last optional tool that will take your beginner’s work to a new level instantly! Pearly white is super handy to use when you need to soften any regular color and blends nicely on the eyelids and inner corners of the eyes. It doesn’t crack like it can happen sometimes with regular colors and gives a soft uniform coverage on the eyelids skin. Now that you have a good handle on what paints to purchase, you’re definitely going to need something to apply them with! For safety purposes, purchase a separate set of brushes to be used only for face painting and not craft painting. For the beginner face painter, we’ve narrowed it down to just 5 brushes that you can purchase for a WIDE variety of designs. These brushes, with proper cleaning and storage, will last for many years! 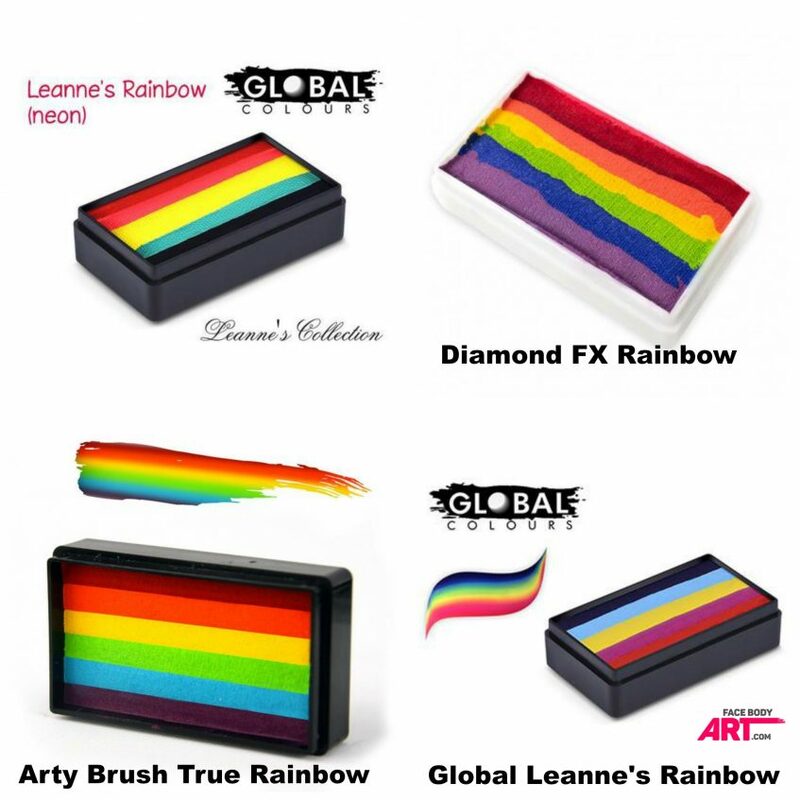 One flat 1-inch brush — in case you want to add a split-cake for painting rainbows to your kit. As a beginner, you will mostly use this brush for painting simple rainbows, which means that this brush doesn’t necessarily need to be professional quality and sometimes even a craft brush can do the job well. Best and most affordable professional flat brush brands: TAG, Bolt flat brush, Loew Cornell. One filbert brush size ½-inch (10 mm) — for covering the eyelids with paint, building up shapes like kitty cat, puppy or bunny ears. Just like the flat brush, the filbert brush does not have to be of professional quality if you are a beginner. You can find plenty of nice filbert craft brushes that will work. If you are looking for a face painting brand, we suggest these affordable brands: TAG, Paint Pal or Bolt. Be sure if you choose to purchase a craft store brush for this option, to choose synthetic bristles over natural. Sponges are the tools you will need to cover large areas of skin with paint quickly. For safe face painting make sure to use one sponge per one child. For this reason, you will need plenty of them even at the very beginning. 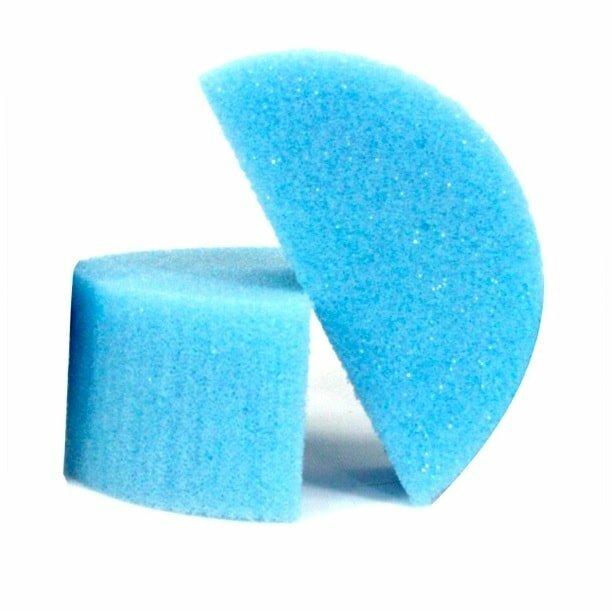 The best options are half-circle sponges which can be found in a multitude of different brands (they come in full circles, which you will cut in half to create 2 sponges). Simply check out our list of shops above. 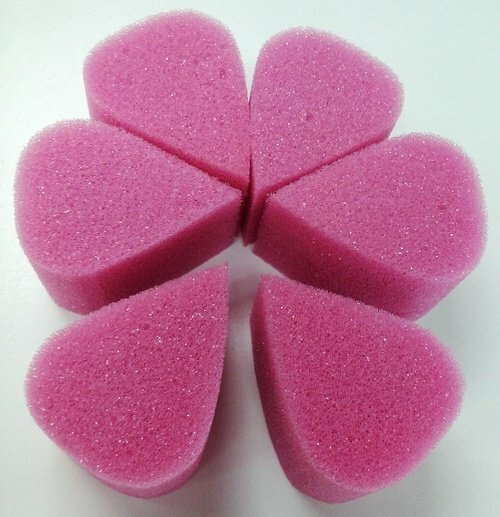 Additionally, if you can get a package of petal-sponges, they will help you create beautiful butterflies. A simple fine mist spray-bottle of about 200 ml (7 oz) capacity is enough. You will use it to activate your paints with clean water. Glitter comes in all sorts of shapes, sizes, and colors. It is up to you which one to choose, just make sure you use cosmetic grade glitter only, which can be purchased in face painting shops or in makeup departments. Craft glitters can be cheaper and look very similar, but craft glitters can be made from tiny particles of metal, and if it gets into eyes, craft glitter can scratch the cornea, lead to corneal ulcers and even cause blindness. It can also stain on the skin or even cause an allergic reaction. So avoid craft glitters at all costs. Tip: Check out “7 Clever Ways to Use Glitter in Face Painting” for some fabulously eye catching ideas! If you want to speed up your work or you aren’t that good at painting freehand yet, add stencils to your kit. They come in all sorts of shapes and textures and you can find plenty of cheap ones at a craft store or online and can work well as a start. (Try these links on Amazon and eBay to get you started). You can even find themed stencils to match a party theme like Frozen or Transformers. However, try avoiding using wet wipes too frequently, or replace them altogether with paper towels or natural fabric moisturized with water and oil (olive or coconut). There are also some brands of organic/bio wet wipes, that are chemical free and biodegradable. Here are some examples: Organic Wipes, Bio Wipes or Water Wipes. Choose an opaque container instead of a transparent one. Even though it is normal that your rinsing water will become dirty after the first rinse, you don’t want to pay extra attention to this. Most likely you won’t be able to change your rinsing water for each new client. An opaque water bowl will look more tidy on your workspace. Make sure you have enough rinsing water in it (approx. 1-2 cups). Don’t be cheap with a few drops of water for rinsing, that won’t be enough for a proper rinse of your brushes. But don’t go too crazy with the amount of water you use, more than two cups are way too much. It won’t help you rinse your brushes better, and will just be in the way. Choose a tall container rather than a wide one. A size of a regular big glass of 400 ml (13 oz) will work the best. Wide containers occupy too much space on your workspace, show your clients how much dirty water you have and even make the process of rinsing more difficult. Choose plastic or metallic container. Your tub should be resistant to any damage. You will be working with kids, so make sure none of your setups can break easily and harm your clients. Avoid glass tools, including the tub. 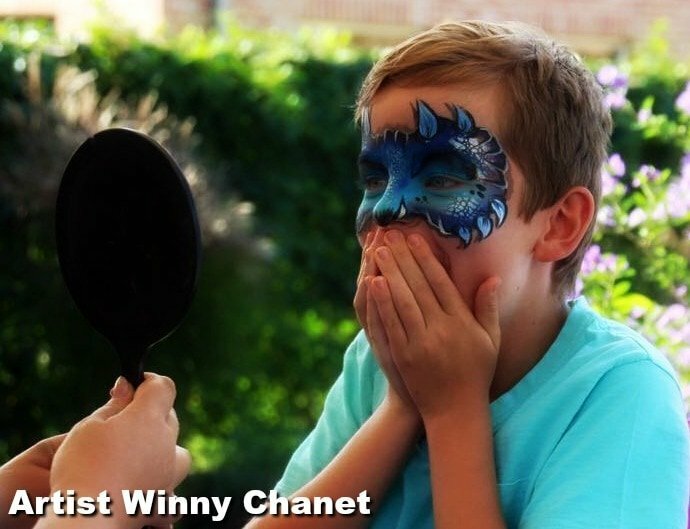 A plastic mirror is the best option when it takes to face painting. Children can drop it easily, so make sure you look for a plastic option or at least covered with a plastic foil that will prevent fragments from detaching and harming your clients in case of damage. Plastic mirrors can be purchased online or in big craft shops. Here is a couple we found on Amazon and eBay for starters. You can use an album or a menu board with images for reference. The key question here is whose work you will be displaying? Since you are a beginner you most probably won’t have a portfolio with your work. A word board could be a good option for you, in this case, it also affords you the ability to grow creatively without having to stick to your original designs, or constantly update them. A good option for a beginner would be a menu board like this one that is sold on Etsy. You are using someone’s else intellectual property and you can get in trouble if you decide to do face painting as a job. You’ll have to build your own portfolio in case you decide to transform face painting into a business. Again, if you decide to make face painting your business, your clients will see that the result they get differs a lot from the images of the menu board and this can harm your reputation. Starting your face painting business. Investments & hidden costs. How to work fewer hours and earn more money. Proper hygiene is an often overlooked but important component of effective face painting. At a minimum it’s important for ensuring your supplies stay in good shape but, especially when you’re painting multiple faces, it’s always best to take proper measures to ensure the cleanliness of your tools. Maintaining perfect hygiene will ensure both you and your clients have the best possible experience. Storing your paints is very important. While you don’t necessarily need a professional quality kit, you do want to protect your paints from dirt, moisture and germs. If you keep them safe and clean, they will last for years! And, if you will be using your paints fairly often, a proper carrying case will serve you well for ease of transport, keeping your paints safe and ease of clean up. 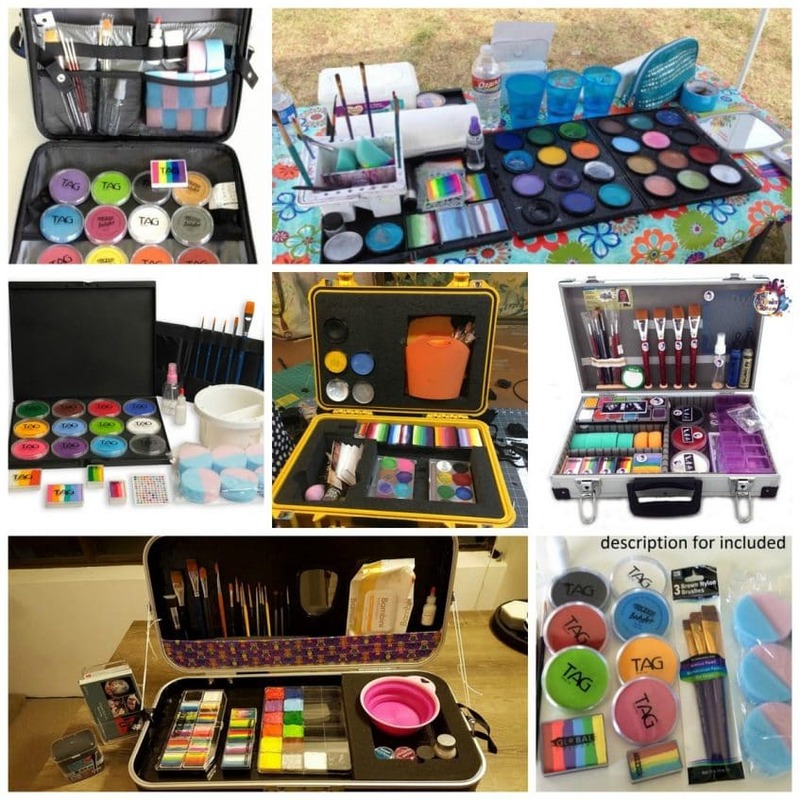 You can store your paints in a converted carrying case such as a small suitcase, gun case, makeup case or even scrapbooking case. The options are endless, use what is available to you! Purchasing from thrift shops or Amazon can get you the best case for the lowest cost. Keep all your paints clean and dry in between gigs. Use wet wipes to clean the surface of your paints, gently rub the dirt in circular motions in singular colors or pull the wipe along the stripes in a split-cake. Sanitize your brushes once in a while during your work. We prefer using a product called Brush Bath by Silly Farm to sanitize my brushes, as this product is specially designed for face painters and maintains its sanitizing effect when diluted with water. Beauty So Clean sanitizer also works great but is more expensive and is effective only when applied on dry brushes and makeup. Always store your brushes clean and dry. Make sure that the bristles are not touching each other or any other surfaces, so they do not bend and always have a sharp shape. NEVER leave your brushes soaking in water. Wash every brush separately with soap and running warm water after every single gig and let them air dry flat in a cool dry place overnight. You may also leave them to dry hanging with their bristles down. Do not store wet brushes with their bristles up, as it may cause water leaking under the ferrule and ruining the brushes. After your brushes are clean and dry, sanitize them. Use one sponge per one child (this is a legal requirement in some, but not all states/countries). Never leave sponges soaking in water during work. Wash the sponges with antibacterial soap under running water or through them in a special bag in washing machine or dishwasher at 90°C (194°F). Leave the sponges to dry out well on a clean towel overnight. Sanitize your sponges with Brush Bath or Beauty So Clean sanitizers. Store and carry the sponges dry and I never leave them in airtight places when they are wet because this can lead to bacteria and mold growth. Safety is of the utmost importance, especially when painting on children. Professional quality face paints very rarely cause a negative reaction. 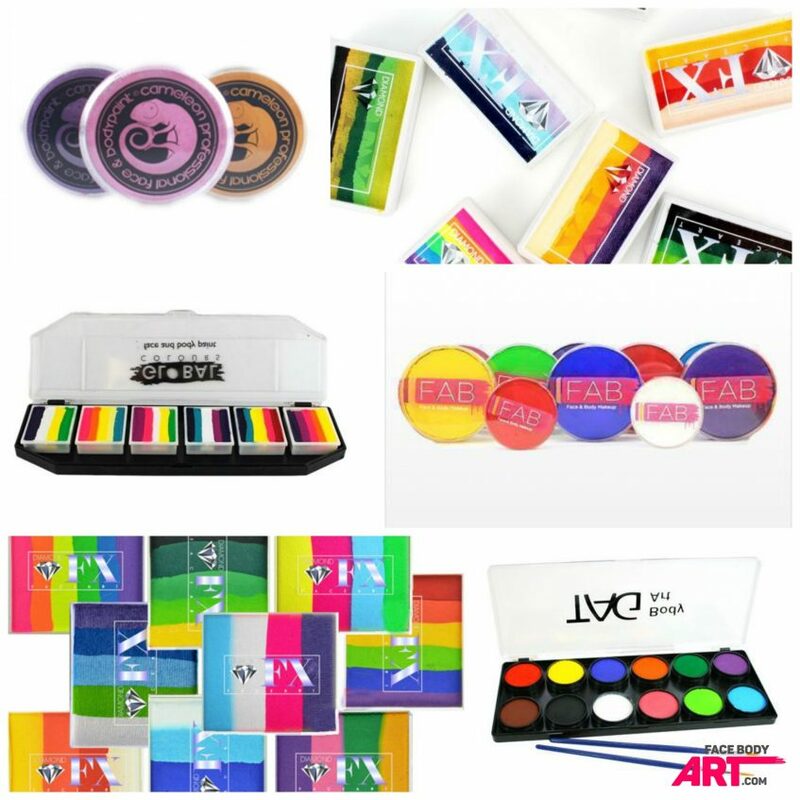 Professional face paint shops, whether in your community or online will need to be your go-to for obtaining products. Craft stores do not carry professional quality products, you can find brands like Snazaroo in these stores, but the quality is quite lacking and will not give you good results. Tip: Read our blog post “You Booked Your First Gig!” for tips on hygiene and other important points before you start. Cheap face paints and craft paints have a high concentration of additives that can cause unpredictable skin reactions. Even if a craft paint has a “non-toxic” label, it does NOT mean that it can be used as makeup. All craft paints contain formaldehyde. The only difference between them is the amount of this toxic substance that they contain. “Non-Toxic” simply means that the amount of formaldehyde is not toxic if a paint gets accidentally onto the skin (under the nails, on fingers). However, this is not the same as covering a large area of skin with this paint, especially the face. Recent studies show that formaldehyde causes cancer because it is easily absorbed through the skin and mucosa. And what’s more, formaldehyde is easily inhaled due to its volatility. Acrylic paints are supposed to be used in well-ventilated areas only because the formaldehyde evaporates as they dry out. Now imagine if this paint was applied next to the eyes, nose, and mouth of a child. No surprise that the vapors will get directly on the mucous membranes and will cause irritation. These children were painted with unsafe paints. Notice the painful and dangerous reactions in their skin! 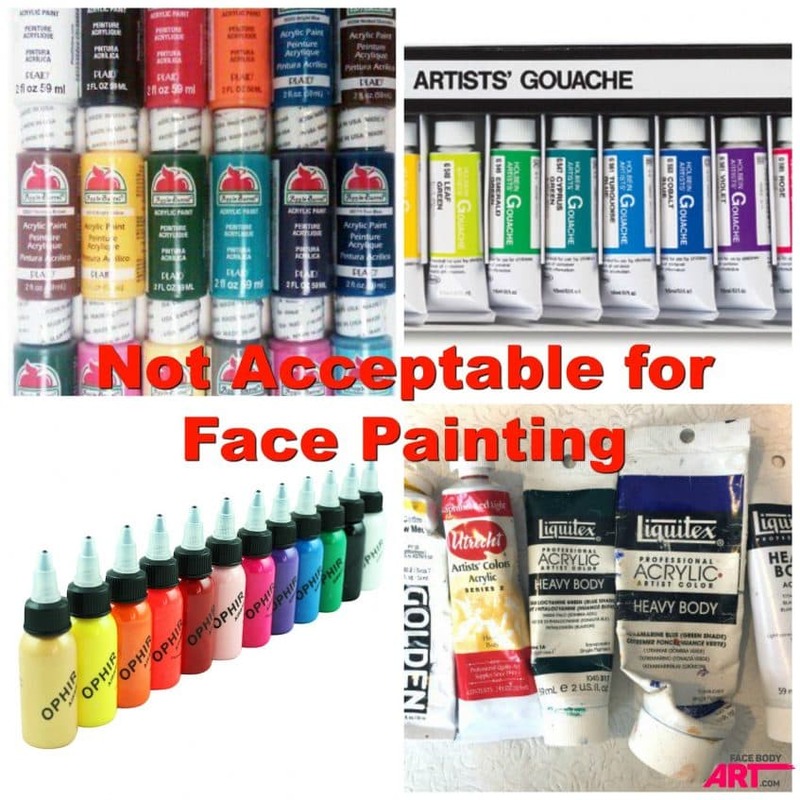 Under NO circumstances should you use or allow others to use paints not designed specifically for skin. Do NOT start by using water. The water will only wash out the top layers of the paint, but won’t break up the pigment and may pack the pores of the skin more with paint. So, start by using soap. Use liquid or bar soap with a few drops of water (baby soap is generally safe around the eye area). Massage painted area with fingertips until a muddy consistency is formed. Use a wet wipe, makeup remover wipes or moisten a paper towel to wipe away the paint. Rinse face with warm water. Repeat steps #2 — #5, if necessary. Do NOT use scrubs or alcohol! Just gently rub the skin and remember, that sometimes it may take a couple times to remove the paint completely. To remove tough areas, use any gentle oil without a strong fragrance. I personally prefer coconut or olive oil. The paint got onto the eyelid area, which has a high concentration of glands that secrete oils. These secretions will adhere the pigments and they can be difficult to wash away with simple soap and water. So just apply a little bit of oil on the eyelids and massage them gently, you will see how the pigment will break down. Then just wipe it off with a wipe or a cotton disk. The paint has a strong pigment. That usually happens with waxy paints like blue, teal, green and sometimes purple. Glycerin based paints usually don’t stain. The paint can also stain more on dry skin, because of being absorbed by dry top layers of the skin. Again, removing with oil will help greatly. After collecting your supplies and understanding the basic hygiene principles, it’s time for the fun part, learning how to do face painting! Here we’ll show you exactly how to do everything you need to complete a successful design from how to make face paint to properly using each of your tools. Learning basic proper techniques to use while you are painting will go a long way in helping you to create professional quality looks in a fraction of the time. Add water by spritzing the paint with the spray-bottle or drop a few drops from the brush. New paints may need a little more water to activate. You may either spritz it with water or work the paint with a wet brush. Wax based paints will require more water to activate, especially the regular and the neon ones. Glycerin based paint will require less water, because they are soft enough already and you can get creamy consistency almost immediately. 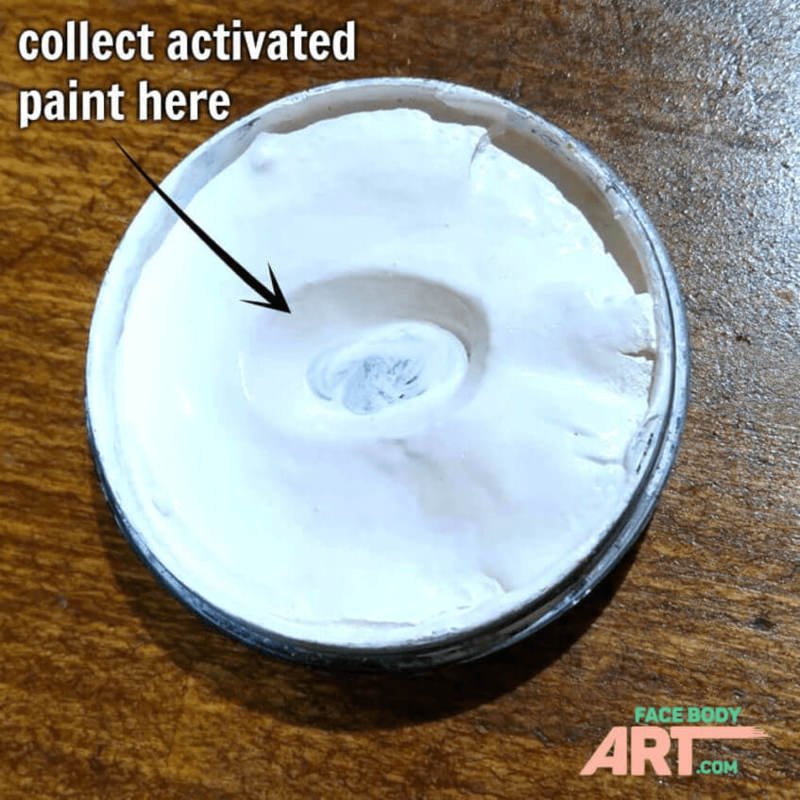 Make a little well down to the plastic in the center of your paint. Collect the activated paint in the well. This will let you have a good amount of paint to use during the gig without spending more time on reactivation. Also, it will prevent your paint from getting gooey, because you will have all the water in the middle, above the plastic and the dry paint around the well won’t absorb the extra water. Rotate your brush on the paint surface and load it up to the ferrule. Be gentle to the bristles and try to keep the tip sharp. At the beginning of each gig, spritz all of your paints with water and leave them to activate while setting up. Used paints will have a dried up cream on the surface that will reactivate pretty quickly once you add some water to it. Vary the amount of water and the time of activating the paint depending on the desired consistency. 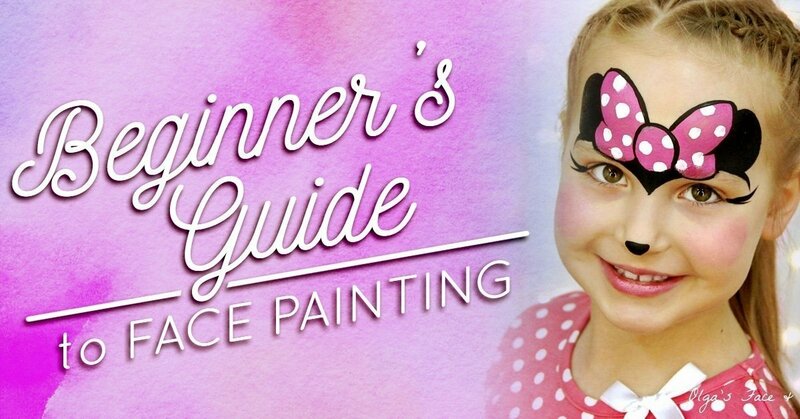 Tip: Read our post “5 Tips for Crisp Lines in Face Painting” for more information! Proper paint activation and consistency is key. There are five main paint consistencies that you should know about. Watery consistency — for creating splashes, drips, and drops, which are mostly used for creating squirted and dripping blood. If you dilute this consistency, even more, you can also paint shadows with it. Inky consistency — for linework with black or any other dark paint. Consistency should be slightly more watery than creamy. Creamy consistency — the most used paint consistency, as it releases the entire vibrancy from the paint. Especially important for linework with white waxy paint, as well as for cases that require thick coverage with other colors. Sticky and dry consistencies — for stenciling and for such advanced techniques like blending and dry brushing. Tip: You can find out more about paint activation and how to work with different paint consistencies in our “How to Activate Face Paints to Get Amazing Results” blog post. Rotate the sponge in between your hands to spread the moisture. The sponge should be moist, but when you squeeze it there shouldn’t be any water leaking out of it. Dip one tip of a sponge into paint and rotate your sponge along the entire surface until the paint in the container is dry. Your moves should be confident. The sponge should slide on the paint, but resistance by the end of loading means that you achieved the right consistency. If the paint in the container is still wet when you remove the sponge, that means that you will have watery paint on your sponge as well. This can cause dripping and ugly splotches. If you feel resistance while loading, that means that you don’t have enough water in your paint. Spritz again. Spritz the paint with a very small amount of water from a spray “mist” bottle. This is the easiest and cleanest way to activate your paint. But remember, only add a little at a time until you find it is a perfect consistency. If your paint becomes too wet, it will not be easy to work with and may take several hours to dry out enough to be usable. If it’s too dry, you can simply add a little more. You can also add water by dipping your brush into your rinsing water and dripping a couple of drops on the paint. However, in this case, the water may contain pigments from other colors that can steal from the vibrancy of the paint you are activating. New paints may need a little more water to activate at first. So, just spritz your new paint a couple of times with clean water and leave it to activate for 5-10 seconds before using. Invest in pro round brushes. This is the case when the quality of the brushes is really important and can take your lines to a completely new level quite easily. Hold your brush perpendicularly to the surface. No matter what kind of linework you do, always hold your brush perpendicular to the skin. Get the right paint consistency. Getting the right paint consistency will help you obtain vibrant colors and sharp lines. Creamy and inky paint consistencies are what you want for linework. Use creamy consistency for your white lines and inky (slightly more watery than creamy) consistency for your black and colored lines. Thick to thin and thin to thick. The most pleasing effect in face painting is achieved when your lines have sharp ends (or at least one end) and thick bodies. Vary the pressure on your brush to obtain lines of different thickness. This skill is very important for a face painter, but it may take months and even years to achieve perfection. Don’t give up if your hand doesn’t listen to you, you’ll eventually perfect applying face paint with your brush. Notice the thick parts of the lines and the thin and sharp tips in these designs. Their alternation creates balance. Both of these designs are being studied at the International Face Painting School. Use separate brushes for white and for black. You will be surprised how this simple trick will change the vibrancy of your designs! Don’t contaminate your “white” brushes with black paint and your linework will always stay clean, crisp and vibrant. A split cake is a tool used by face painters to create beautifully blended looks, literally with the stroke of a brush. Quick rainbows, butterfly wings and more can be elevated with the use of the glorious little creations. One strokes are also intended to be used with sponges. These larger versions will allow you to create beautiful tigers, masks and more in a fraction of the time and with added wow factor. 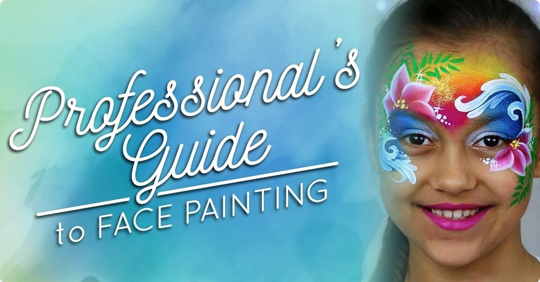 More in-depth instructions and details can be found in our companion blog entry How to Become a Professional Face Painter and Get Paid. Learn to face paint from the best in the industry. Don’t waste money on workshops with no-name artists. Bad habits are very difficult to eradicate. Practice every day or every other day. Train the steadiness in your hand. Start by reading this Guide. Watch free tutorials on our YouTube channel. Read our Face Painting Blog. 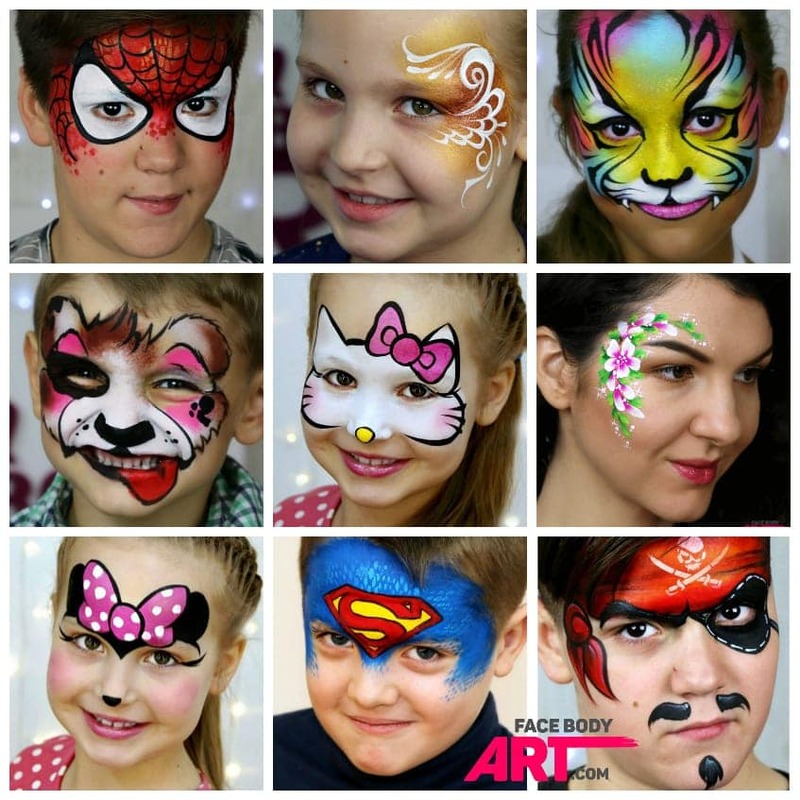 Take the Free Trial from the International Face Painting School. 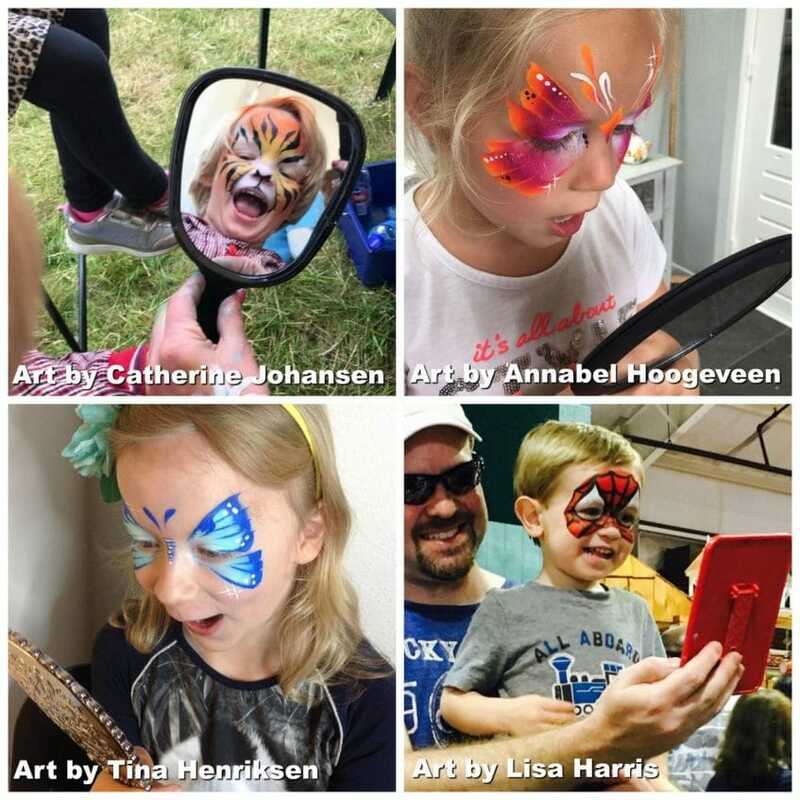 Join face painting groups on Facebook — Share your work there and follow what other artists are painting. There is a ton of inspiration and motivation in these groups. Enroll the International Face Painting School and learn the art of face painting starting with the very basics under the thoughtful guidance of a professional instructor. The amount of detail put into these courses is second to none. We have students who range in ability and experience from absolutely none to professionals with years of experience. These face painting courses and the personalized instruction will take any aspiring artist from amateur to professional. You will also get plugged into our very active online community of fellow students who will encourage and enlighten you on your journey. The best part? You will forever have access to the School and any updates and new information that gets added over time! Take a class with a professional instructor. There are a handful of super talented artists with amazing teaching skills and great experience in hosting workshops. A one day workshop will typically cost you around 100-150 EUR, but it is totally worth the investment if it’s with a leader of the industry. Your own face — the most available option at any time. Your forearm and your thighs — great for practicing your linework and other techniques. The back of your husband/kid/friend — a great way to practice your work on a vertical surface. Other people’s faces like your kids, neighbors, relatives etc. — works for practicing designs and taking photos for displays/portfolios. Practice pads and practice heads — in case your skin is very tired of way too much painting, these are well worth the investment in case you want to transform face painting into a business. Congratulations,  now you know how to face paint and successfully complete a professional and fun design. We hope you found this step by step face painting tutorial helpful and are confident enough in your skills to get started. The only way to know for sure is to start so pick a design you want to do and get painting! 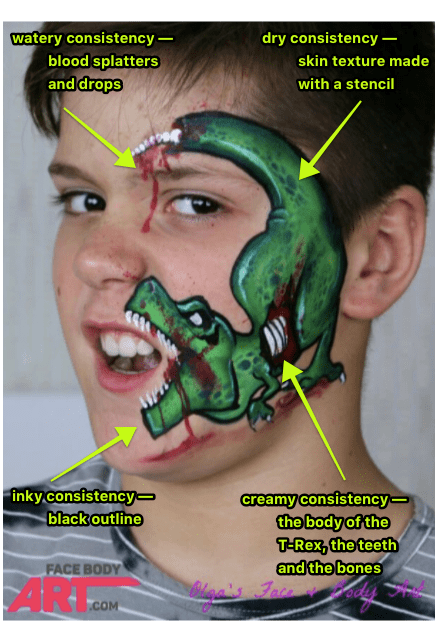 Tip: Check out our “TOP 10 must-learn face painting designs (and +1 more)” blog post for more ideas. Halloween: all sorts of scary stuff like monsters, skulls, zombies, vampires, ghosts, bats, pumpkins, black cats, witches, haunted houses etc. Easter: bunnies, Easter eggs, cross etc. Christmas: holly, reindeer, snowman, Santa, Grinch etc. Pokemon Party, Frozen Party, Minecraft Party and all sorts of different themed parties. Tip: Check out our “Christmas Blog  Inspiration gallery, Tutorials, Step-by-Steps and Tips for holiday season” for more ideas. This is an exciting milestone! Your first gig will give you invaluable experience and help you set the tone for future jobs. — Advanced painting designs, and more! Dress up appropriately (no mini skirts or low cut tops). Use wet wipes for cleaning your hands and setup. Decide on 10-15 faces to start with. Practice them and get them down solid. Pee before you start. You do NOT want to find yourself an hour into a busy gig with a 20-kid-deep line having to stop and run to the bathroom! Take plenty of drinking water. If you allow yourself to get dehydrated, especially at hot outdoor gigs, you can find yourself in a serious medical emergency. Also, for gigs over 3-4 hours, take yourself a healthy snack. Protect your workspace! Kids are going to try to touch your stuff! They just are. Accept it now. How are you going to deal with it? You don’t want to terrify them by yelling… Be firm, ask them not to touch your things when they try. Be sure they understand it’s not allowed. But, if you get an extra rambunctious child, be prepared to tell them they cannot get their face painted if they do not behave. Take photos of painted children only with parent permission. Some parents may have personal reasons for not allowing their children to have their photo taken and especially used for advertisement purposes. Getting permission is vastly important. No matter what you do, even if you do very simple and basic job, if your art makes children happy, then you’re doing amazing! Because that’s why we all do it! For the sake of those priceless mirror moments! Don’t use perfumes. Small children (and even some adults) can be extra sensitive to perfumes and some may have allergies. And of course, if you’re a smoker, you should never smoke near, before, or during your job, especially around children. Don’t paint on sick children with infectious diseases like flu, cold, herpes, chickenpox, measles etc. Don’t paint on kids with allergic manifestations or skin damage: allergic or contact dermatitis, asthma in its active phase, broken skin like ulcers, wounds or blood crusts. Don’t be too hard on yourself! Don’t panic! At the end of the day, you are an artist, not a doctor. There aren’t going to be many life or death situations on your hands, so relax! There will be weird or unusual circumstances that come up eventually… accept it now. But when life happens, remain calm and look for a solution. Take deep breaths, and remember to laugh. You can turn a stressful situation into a good laugh if you are able to simply step back and look from a different perspective. Honestly, we could go on for days about how amazing the face and body art industry is. We’re a little partial.  We hope you liked our detailed face painting tutorial and if you decide you really only want to get into this for fun, that is totally ok! It IS fun! You can be the star of your 6-year old’s birthday party when you break out the face paint! But in the instance that we’ve piqued your interest in a career you had no idea existed before… don’t stop here! You’re just getting started! Hop on over to the multiple articles we’ve linked for you, or even sign up for our FREE TRIAL of the International Face Painting School for some personalized tips and instruction from our amazing instructors! We cannot wait to see what you do! Show us how you’ve used this article to get you started.